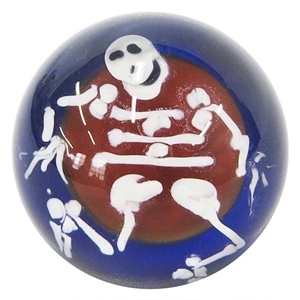 MoonMarble.com - David Salazar - "Skeleton Marble"
Art Glass → Contemporary Handmade Marbles → David Salazar - "Skeleton Marble"
This is a signature style handmade contemporary marble by David Salazar. It depicts a rattly skeleton hovering over an orange moon floating over a transparent dark blue background. This marble measures approximately 1 5/8" in diameter. Signed and dated by the artist.